A Northwestern University-led team recently found the answer to a mysterious question that has puzzled the materials science community for years—and it came in the form of some surprisingly basic chemistry. After studying the material for many years, Huang realized that the secret of GO’s mysterious insolubility was the unintentional introduction of a common contaminant. To make a GO film, many scientists pass the acidic dispersion of individual sheets through porous anodized aluminum oxide filter discs, which are popularly used for preparing membranes of many nanomaterials. Huang’s team found that during filtration, the aluminum filter discs corrode in acidic water to release a significant number of aluminum ions, Al3+. The positively charged ion bonds with the negatively charged GO sheets to stabilize the resulting membranes. 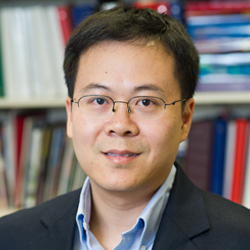 Huang’s research is described in “On the origin of stability of graphene-oxide membranes in water,” published in Nature Chemistry on January 5. Other authors of the paper include graduate student Che-Ning Yeh, postdoc Kalyan Raidongia, former visiting graduate student Jiaojing Shao, and Shao’s former adviser Quan-Hong Yang from Tianjin University in China. The National Science Foundation and Office of Naval Research funded different parts described in the paper. Huang’s finding also indicated that GO films are not as strong as researchers once thought. The aluminum ions make the film much stiffer. Without the ions, GO is three to four times weaker.